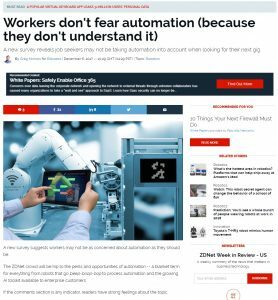 ZDNet has a good summary of a few recent reports on automation, a subject I’ve covered here more than once. The more interesting survey report is from a Harris Poll for ZipRecruiter, an online employment marketplace. ZipRecruiter’s nationwide data shows 60% of job seekers believe fears around robots taking away jobs are overhyped while 2 in 5 employed job seekers (41%) believe their current job will be automated within their lifetime. This is more than likely because workers asked, don’t see the big picture. They don’t get involved with decisions and discussions about how to cut cost and risk from their workflow. I’m not saying that we’ll wake up one day and everything will be taken over by robots, that’s not the case at all. It’s worse than that, automation is insidious and for the most part, invisible. 4 in 5 job seekers agree that the current technology boom has left certain people (84%) and cities (78%) behind. Half of job seekers (50%) say the introduction of the Internet has generally done more harm than good. Employed job seekers are more likely to agree with this sentiment than unemployed job seekers (53% employed vs. 40% unemployed). 2 in 5 job seekers (44%) believe there is no such thing as a bad technological advancement. What this ignores, for the 50% that thinks the Internet is good, is that without it, and the automation and communication it has enabled, the workplace would be very different today. And that is one way the creep of insidious automation has been taking over. The machines are coming – 2049? Presentation contains some of my wins, and many of my losses. It was much easier to build on these, especially the societal impact in my 2003 “Trends and Directions” presentation. Societal impact is much easier to predict as you can demographic data, current trends and it’s pretty easy to extrapolate. Technology adoption is much harder. Many of these predictions are not useful, after all who needs a robot to write high school essays? Many though will continue to fundementally change work and life as we know it. What they are though is a signal in the way the World Economic Forum predicts the technology will develop, and to some degree it’s a self fulfilling prophecy. Watching this and reading many of the “machines are coming” articles that have been published over the past 5-years, it’s easy to become depressed about the rise of automation, AI, and robots. In a year when the sequel for Blade Runner will finally appear on our screens, there are some key things to remember. There is no magic, no silver bullet – If they can’t explain it, or worse don’t understand it, they have not invented it. Machine learning is great, but the machines can only learn with the machine learning constraints they have. Listen to the doubters – Doubt is very different to dismissal. People who dismiss possibility out-of-hand either don’t understand the opportunity and the potential, or are afraid of the change. It’s the doubters who have thought things through and understand the problems and the weaknesses. Don’t fear automation – If you do, you will be left behind. Learn, adapt, change; if possible work to invent the future By all means be a doubter, don’t be a dismisser. Find a problem, don’t start with a solution – AI, Robotics, Big Data, Machine Learning, Algorithms, Neural Networks are all speciality fields, grabbing onto them and asking how can we use them isn’t useful. The more specific you can be about a problem that needs solving, the easier it will be to identify the correct technology. Be Human – the more we automate, the more important human interaction becomes. The more empathy you have for someone who has a problem, the more likely you are to be able to understand how to solve it. Empathy, the arts, sports and human interaction are all fields where robotics and automation are least likely to take over. Author Mark CathcartPosted on August 25, 2017 Categories automation, culture, environment, films, Life, technology, transport, workTags automation, blade runner, robotsLeave a comment on The machines are coming – 2049?